Scanning covers from a trade isn’t easy. What they got right: I do like seeing how the heroes come up with an alternate plan for destroying the Sun Eater. 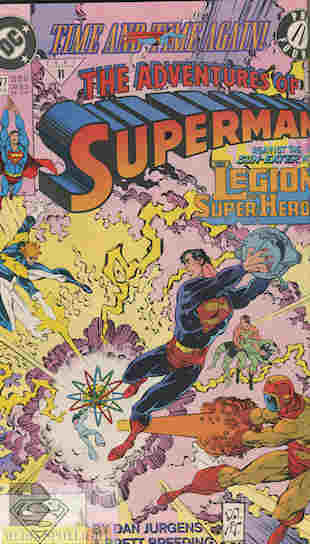 Not knowing anything about the creatures or what the Legion comics were doing with it that’s all I can comment on. What they got wrong: Nobody cares about Bibbo getting drunk, Perry’s marital problems, or Jimmy’s mom ruining his date. Stick to the important parts of the story! Recommendation: A good story on it’s own even if it seems to add little to the storyline. Worth checking out though. Posted by ShadowWing Tronix on October 23, 2017 in DC Spotlight, Yesterday's Comics and tagged Dan Jurgens, DC Comics, DC Universe, Legion of Super Heroes, Lightning Lad, Phantom Girl, Shrinking Violet, Sun Eater, Superman, Time And Time Again, Ultra Boy, Wildfire.